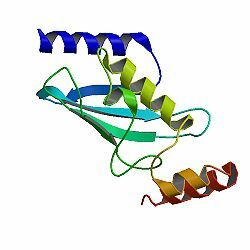 Recombinant Human Ubiquitin Conjugating Enzyme 10 produced in E.coli is a single non-glycosylated polypeptide chain containing 191 amino acids and having a molecular mass of approximately 21.1 kDa. Less than 1EU/μg of rHuUbcH10 as determined by LAL method. We recommend that this vial be briefly centrifuged prior to opening to bring the contents to the bottom. Reconstitute in sterile distilled water or aqueous buffer containing 0.1% BSA to a concentration of 0.1-1.0 mg/mL. Stock solutions should be apportioned into working aliquots and stored at <-20°C. Further dilutions should be made in appropriate buffered solutions.